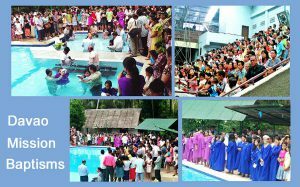 September 22, 2012 was the culmination of the SABBATH SCHOOL Small Group Convention held in Davao Mission. I am one of the adopted ministers who did the ground work before the convention. Praise God for the Holy Spirit had touched 152 of those whom we gave Bible studies; they decided to accept Jesus as their personal Savior through baptism. At this time, I am still giving Bible studies together with my co-adopted minister, Pastor Rubin Palmes in preparation for another crusade in the Buhangin District under the supervision of our district pastor, Pastor Jerry Jose. I thank all of our sponsors for your continued support of Adopt a Minister. May our loving Lord bless you all for your big help to God’s work here in Davao Mission.